The Grenville was ordered on the 12th June 1941 with 7 others of a class all with names beginning with the letter "U" ie: ULSTER and when launched she was the leader of the 7th emergency flotilla. In 1943 Grenville in company with other destroyers took part in night sweeps up and down the French coast. On the night of the 3/4th October, Grenville and the 4 other ships encountered 5 German R class destroyers who had laid a trap for them. A battle commenced with heavy damage and casualties suffered by both sides. Grenville was hit and stopped. The rest of her war was spent in the Bay of Biscay, where she had a very active career. The full story, told by her captain, is to be found in the book "DESTROYER CAPTAIN" by Roger Hill. In our opinion this is one of the finest true sea stories that we have ever read and for the modeller it is a must. 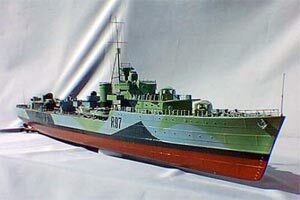 During the 1950's Grenville with the rest of her sisters were converted to type 15 Frigates. She was scrapped by Romanet Ltd of Rochester Kent, and the No X draught mark was removed and presented to DEANS MARINE. The plated glass fibre hull is the base for this kit. Deck support beams are from balsa and hardwood, main decks and super structure are in 1mm plastic for quick assembly and vac-formings for the funnel, boats and turrets etc. Brass etchings for all stanchions, ladders, are included in this kit along with a full set of fittings in vacast plastic and light cast alloy. To complete this model both propshafts in stainless steel, proptubes, rudder, ect are included along with recommendations for motors, nicads, and speed controllers.